At this time of the year, I am usually in Morocco. I love Autumn in the Maghreb. The date harvest is in full swing as is the olive harvest and the pressing of the new season’s oil. But the absolute highlight for me, is the 2 week saffron picking period. We get up at dawn to drive for the hour or so from Marrakech to the foothills of the High Atlas Mountains. The young girls of the area arrive at about 7am, warmly dressed against the biting cold, to pick the saffron crocus flowers before the sun rises and the flowers open. The girls are all in their teens and supple enough to bend from the waist, plucking the crop and filling their baskets. 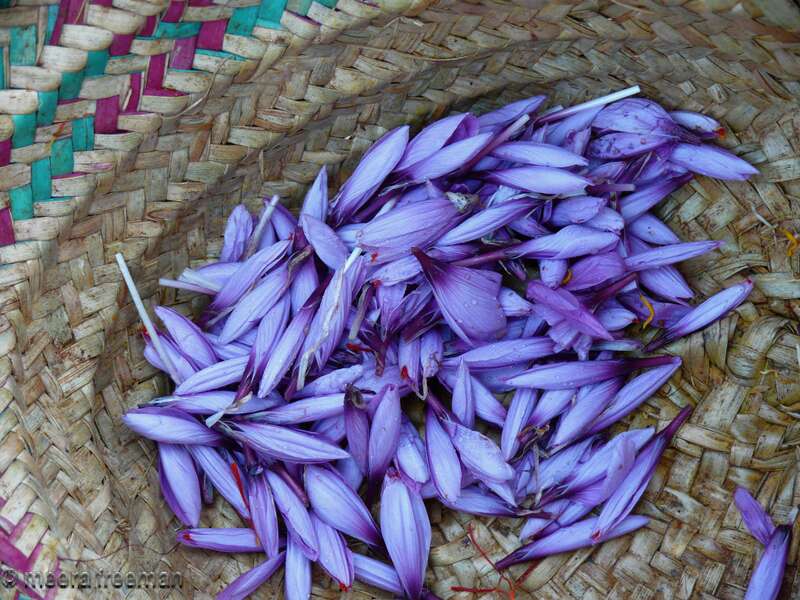 The bright purple flowers contain just three red stigmas each – the part of the flower that, once sorted and dried, will constitute the most expensive spice in the world! 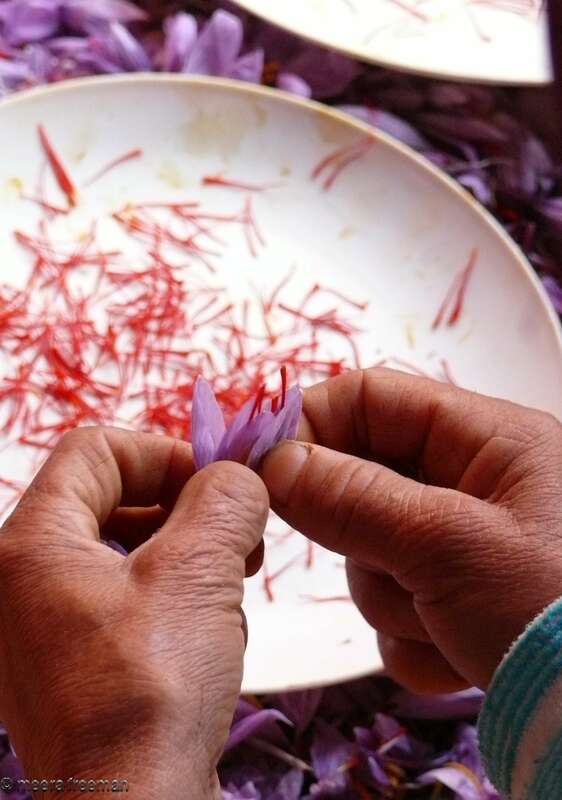 It takes 140 flowers to yield 1 gram of saffron. As the flowers are picked, they are transferred to the sorting room where older, more experienced ladies (no longer able to bend from the waist as easily as their daughters and granddaughters) remove the stigmas from the flowers and send them to the drying room where they will give up their moisture and develop the exquisite flavour and colour that make them such a prized commodity in the culinary world. True saffron (zaafran horr) is used in many Moroccan dishes, and is often combined with ground ginger and black pepper, and sometimes a little cassia bark, in the most lavish of tajines and celebration couscous preparations. Those who cannot afford it resort to zaafran roumi (yellow food colouring powder) to emulate the appearance if not the flavour of these extravagant dishes. In the saffron growing area of Taliouine in the High Atlas Mountains, I have been lucky enough to have been served saffron tea, brewed with a scant spoonful of green tea leaves, a pinch of saffron and sweetened with pieces of cone sugar! why are you not in the maghreb this year? must go there next year for saffron season. other destinations on the cards this year. Hoping to be back again in 2012. Very small window of opportunity for the saffron pick – usually 2nd 2 weeks of November. My next tour is in April for World Expeditions. When are you going to Turkey next?